Some people consider smart and creative people as one of the rarest of the rare, they have met in their lives. Most of the highly creative people are provided with all sorts of respect and attention from everybody around them because of their creative thinking skills. These highly creative people deserve such level of attention and respect because of their creative intelligence and smartness. There are several difficult things which are considered as an impossible task to be done, but these creative personalities get it done within seconds. Creative personality traits and characteristics of creative people are very important for any company growth. There is a list of things which are considered understandable only by the highly creative ones and also are some personal characteristics of such people and they are as follows. Most of the time common people try not to mess with such questions which requires more answers. And that is why people consider highly creative people as a challenger for the system. The highly creative people challenge the system with the status quo, which means most of the highly creative people are more curious about certain fixed norms and they even try to change it with some of the alternatives available. As it has been seen in the childhood stories and school books, most of the brilliant minds made their experiment successful using regular things which comes and goes around on a normal life. Similarly, these highly creative people inspire themselves using least expected things in their life. Most of the creative people dream a lot in their life. The best part of their life is that they daydream a lot about their future and their creative elements which can help them make a big change in their life. 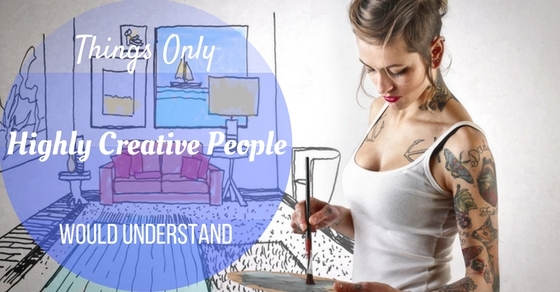 Therefore, these highly creative people are never understood by common minds. They daydream a lot about and more importantly they daydream about their experiment, which creates a big change for the good of the mankind. It is possible that people get bored of stuff which they do every day without any much effort as it has been a practice. But it is not that same with highly creative people as they consider things boring if they understand or solve it easily. Therefore, most of the time highly creative people keep switching their interest as per its level of risk and understanding. Moreover, it is not easy to keep them occupied with small things. It seems different, but most of the highly creative people behave like a kid. This might be considered as one of the irresponsible things that anyone would do with their life. But it is true that most of the highly creative people think like a child. And their energy levels are always being high as compared to a child. Therefore, it is quite obvious that all the highly creative people behave and act like a kid and it is not that easy as it seems for the rest of the people. Being a common man whenever things go bad and it is impossible to solve such a problem, then it is quite normal to quit at some point of their life. But not true with highly creative people. Most of the highly creative people believe in working hard for the sake of their life target. Therefore, it makes clear to everyone that all the highly creative people never quit their task even if seems impossible to achieve and that is why they are considered as those who understand everything. Most of the people don’t believe in a field of work which involves creative stuff. For example, working as a dancer or a painter or a musician and much more. These mentioned career lines are considered as one of the unstable career options, one can ever choose for their life. And that is why most of the creative people are advised to get a real job instead of wasting their time on creative stuff. It is quite normal that people follow their heart when it comes to anything which matters their life. But that’s not true, people follow their heart most of the time and otherwise they just believe what their mind says. Similarly, all the highly creative people avoid their mind completely when it comes to their heart. They believe in following their heart completely as their passion for life makes things clear for them if their heart justifies it. As compared to a common human mind, a highly creative mind can be considered active than a common human mind. They try to complete the task assigned to them in a completely unique manner. And that is why their minds run comparatively active than a normal mind. Therefore, people who never feel tired of stuff they do are considered as the active one’s, but highly creative people are considered active because of their unique work they deliver. As explained earlier, some people consider their work as a waste of time and it is not secured. But highly creative people believe in what they do. They work really hard to get what they want in their life. And that is why they never give up on their dreams which ultimately will get them to their final goal of life. Therefore, it is quite clear to everyone that all the highly creative people deliver their work with complete honesty and creativity. As their work involves most of the creative stuff and keep themselves around such work, that is why they just lose the track of their time with their constant work. Moreover, creative people take things more serious than others and that is because their dream to achieve something creative takes a chance of risk. And, these risk elements need to be handled with hard work, dedication and creativity. It is possible that some of the things in one’s life get so messed up that they lose their hope of doing it right. But on another way these highly creative people find their own opportunities in these highly stressful situations without even a streak of sadness. They are considered as their own critic and that is why it is not that easy to satisfy themselves. Therefore, it is quite difficult for them to convince themselves that they did a real good job with their work. It is not easy for anyone to be proud and humble at a same time. But these creative people have never shown off their pride in front of anyone. And they always try to behave at their best with everyone. It is easy to find a creative person from a lot of people. And that is possible by the way that only creative thinker try to finish their work in a complete creative manner than the rest of the people. Most of the creative personality believe in spending more time with them than with others as to avoid distractions. Therefore, all the creative people work in a closed environment where nobody ever would try to trouble them with their work. As it is clear with all the above mentioned creative things to do, most of the creative people believe in doing their work with complete honesty and creativity. And to make that happen, they need focus and determination of handling any sort of difficult situations. As they believe their heart more than their mind, then it is quite clear that they are more off sensitive than a strong person. Here sensitive does not mean that they are physically weak. Actually, these creative people value their emotions than their actions. As their field of work gives them all sorts of negative energy each day, but these creative people do not feel a thing about these negative stuff going around in their life. Therefore, these creative people are considered as one of the amazing positive people. As most of the people fail to do that, most of the creative people have a nature of celebrating everything in their life, even if it is sadness. Therefore, all the creative people consider appreciating happiness as well as sadness equal without any changes. People who live a corporate life understand that professional and personal lives are two different things and should not be mixed. But the problem with the creative people is that they take their work more personal than professional. And eventually this kind of behavior messes up everything for everybody in their life. Having an intuition about something which matters to people in their life is a common thing. But when it comes to creative people most of the intuitions comes true as they appear for a second in their life. It is like a disease for them that once they believe in doing stuff in a creative way, then it is never possible that they can deliver their work in a normal way. Therefore, creativity and innovation can be pro and sometime it can be considered as one of the cons for a creative person. As a matter of fact, it is true that all the creative people hate boundaries which limits them to complete their task in a certain manner. Therefore, people need to stop limiting creative people of their work. As all the creative people deliver their work in a most creative manner. Similarly, these creative people hate all those things which connect them to numbers. And especially to mathematical issues. That is why these creative people avoid completing anything which comes with numbers. As people with creative eyes believe in doing their thing in a complete creative way, there is an amazing quality of their work and that is their ability to observe things. Because of this observing talent, these creative people deliver their one of the finest work of art. There is a possibility that all the creative people demonstrate or execute their work with complete honesty and creativity, it is quite clear that because of their creative nature of the work they experience all sorts of new things in their life. Most of the work executed by the creative people are delivered with the complete level of perfection. But following perfection in one’s life is not an easy task as it seems. Because of the habit of doing stuff in a perfect manner a creative person might keep repeating work until its done. As it has been explained several times that all the creative people follow their heart and with that level of passion over one’s work, a person always can be considered as a one who loves and respects his job especially when it is creativity based. These highly creative people are considered very intelligent with the way they are. Moreover, their approach towards least expected things makes people wonder about their brilliant nature of imagining things. Finally, the bottom line is that the discussion over the things which only can be handled by highly creative people gives detailed information about their level of understanding. Therefore, if anyone needs to obtain more information about these highly creative people, then they can read all the above mentioned discussion over highly creative people.